By age six, he was accepted as a private piano student of the Associate Director of Music at the University of Utah, Dr. Vedrana Subotic. 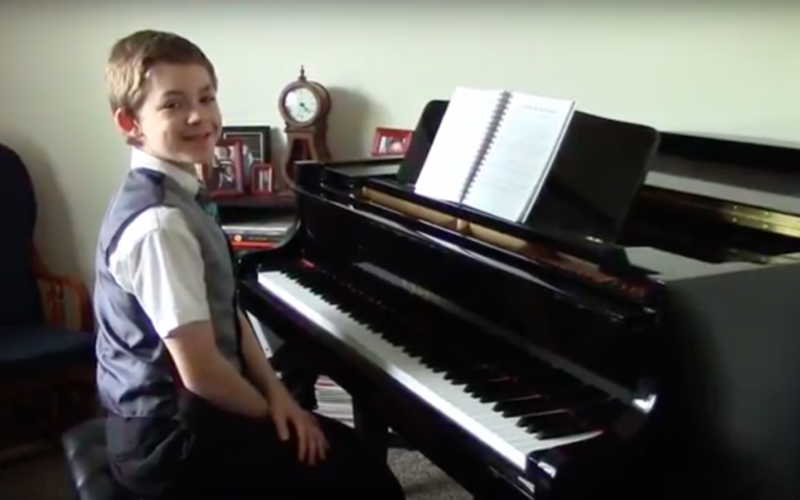 After a year of lessons with him, Caleb performed at the 2010 Summer Arts piano competition at the University of Utah and won the Iron Man Award for being the best overall in his age group. He also won first place in solo performance, first place in theory, and second place in sight reading. Since then, Caleb has won many other awards, which are listed on his Facebook bio page. He also serves as the pianist for several community choirs and his school jazz band. He has also performed with symphony orchestras on multiple occasions. Additionally, he plays the organ at his church and volunteers to play at hospitals and nursing homes. Caleb Spjute is from Murray, Utah. Click here to listen to a sample of his piano playing on SoundCloud. He also has a few videos on his YouTube channel, but his most recent videos are uploaded onto his mom’s channel. Caleb does something called Sundays at 6 where he plays a hymn that is uploaded every Sunday on his mom’s channel. Recently, he performed an online concert live on Facebook for the Moroni Channel. During the concert, he also shares more about his story. Click below to see it.